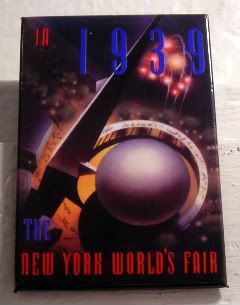 I love World's Fairs - I've been to one or two, but mostly I love seeing what the other ones have done in the past. The 1939 World's Fair first piqued my interest because it played host during the 5-day royal visit of King George and Queen Elizabeth, the same visit that included hot dogs up at FDR's place in Hyde Park. The fair was held out in Queens, so it was at the Queens Museum of Art (one of the few original fair buildings) where I bought this magnet. It's a fair poster that features the theme center - Trylon and Perisphere, what some reports called the ball and bat. Heh. It housed the "Democracity" exhibit, a utopian world view of the future. People would walk up the long, giant ramp around the globe, through the 610-ft tower, and into the 18-story giant globe, which was reportedly something like twice the size of Radio City's interior. What I can't believe is how these two giant structures were dismantled at the end of the fair! Actually, most of venues were demolished after the fair, leaving various supercool books and random supercool footage and documentaries to tell their stories of long ago. I picked this magnet for today, because after being totally sucked into Being Erica on Hulu, I'm totally watching this Being Erica Do-Over Marathon on SoapNet today. I completely and totally disagree with the major plot-point of the show. Our heroine Erica has had a life of bad choices. In fact, she has so many regrets in her 32-year-old lifetime that the fates have granted her a way to go back in time to fix and/or course correct her life. Don't get me wrong, there are probably one or two events in my life I wouldn't mind revisiting or course correcting, but I can't see a sadder outcome than a life of bad choices and regrets. Still, I'm thoroughly charmed by Erica, played by Erin Karpluk. She's a cute character, and watching this Erin chick play her, is like watching the best of Lauren Graham and Joanna Garcia. Even though she's that cute chick that boys fall over themselves for, she's still kinda everyday normal, and you just want to be her pal. If only to borrow from her superdupercute (though not everyday-sized, but whatever) wardrobe. Plus, she's somewhat close in age to me, so when she goes back in time, it's always fun to see the clothes and music I grew up with. And, I'm sure it's that same music that will make a DVD boxset cost-prohibitive to produce, so I'm dropping the show to DVD. Truth be told, though, if I had the chance to go back in time to visit for a bit, it likely wouldn't be the famous places or people and not necessarily even my own timeline. It'd probably be these World's Fairs and Expositions dotted through history - each fair a snapshot of a time period, with a dreamy focus on the future that they were all expecting, based on a past they didn't want to forget. Why do I have vague memories of you writing a post about a San Francisco Exposition? I don't see it in the archives. Yeah, the search function on blogger and the google function on here doesn't always bring up stuff that I've blogged about. Quite annoying, especially because after almost 700 magnets, I'm starting to forget what I've talked about.